For users of the Electrochemistry Module, COMSOL Multiphysics® version 5.4 brings multiple ion transport in ion-exchange membranes. Read more about this electrochemistry news below. The new Ion-Exchange Membrane domain node of the Tertiary Current Distribution interface automatically assigns a fixed and immobilized charge to a domain, and the corresponding Donnan boundary conditions to neighboring domains. The node supports ion transport of multiple ions in the ion-exchange domain, and multiple-ion Donnan boundary conditions. The Ion-Exchange Membrane Boundary node has also been updated to support multiple ion transport. 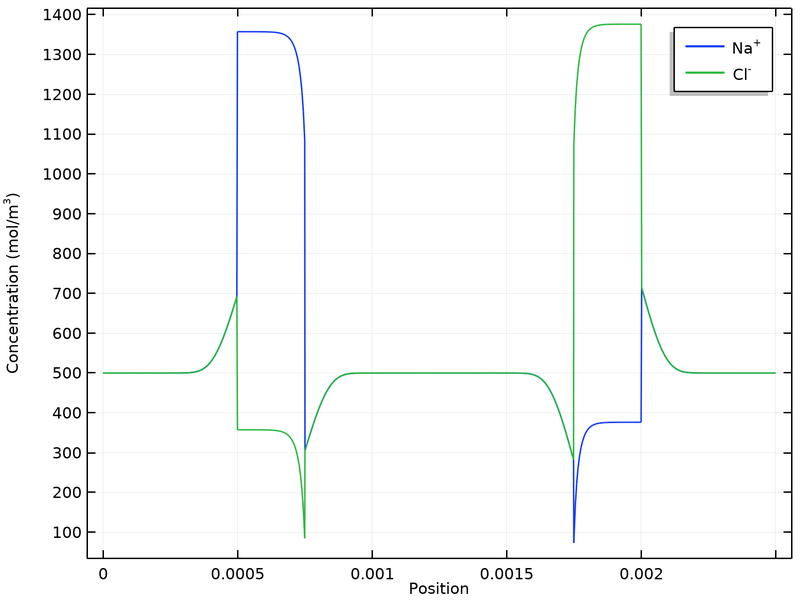 This improvement offers extended capabilities for modeling electrodialysis and flow batteries. For more information, check out this corresponding blog post: How to Model Ion-Exchange Membranes and Donnan Potentials. You can see this feature used in the Electrodialysis model. Concentrations of sodium and chloride in an electrodialysis cell. Both ions are present in both the cation and anion exchange membrane domains. Concentrations of sodium and chloride in an electrodialysis cell. Both ions are present in both the cation and anion exchange membrane domains.